CEREC allows more of the healthy tooth to be utilized providing for a very strong restoration …and no impressions are required. 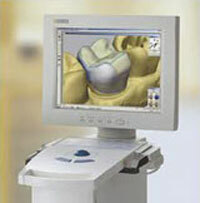 It is now possible to have that perfect smile in one day using this technology. Best of all, the Veneers/Crowns are made entirely of porcelain (metal free) and come in many shades to match existing teeth as well as “bleached” shades for the whitest of smiles! View a few of Dr. Drahota’s actual Before and After makeover smiles.